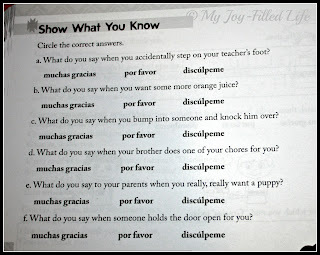 I have been wanting my children to learn Spanish for years! 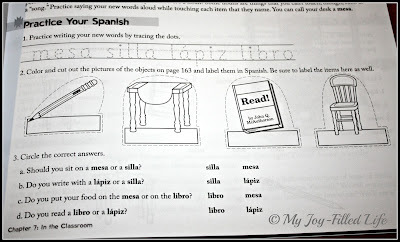 My husband grew up in a bilingual home and he speaks fluent Spanish, so I thought it would be great for my kids (and even me) to learn to speak and understand it, even if just a little. I suggested to my husband that he only speak Spanish when he is at home as a way for us all to learn it, but that only lasted about 10 minutes! It was too frustrating for Mommy the kids! 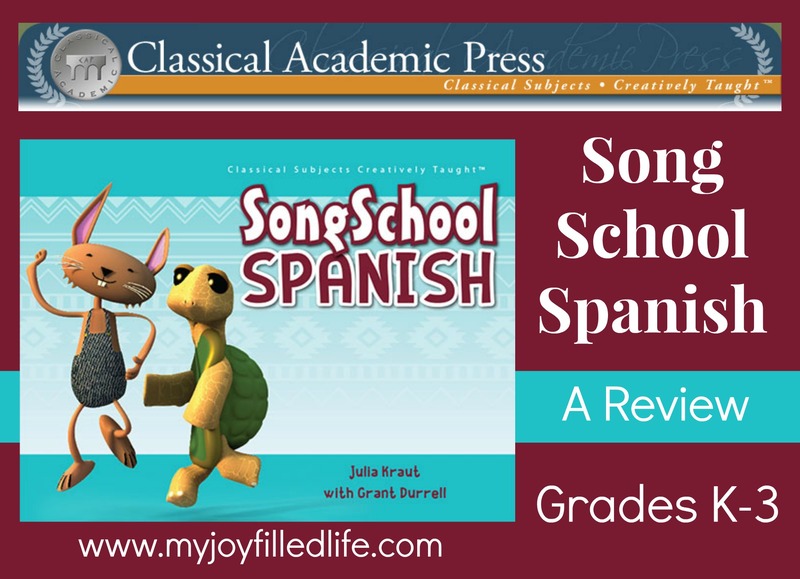 When the opportunity to review Song School Spanish by Classical Academic Press came along, I was super excited and jumped at the chance to try it out in our home. 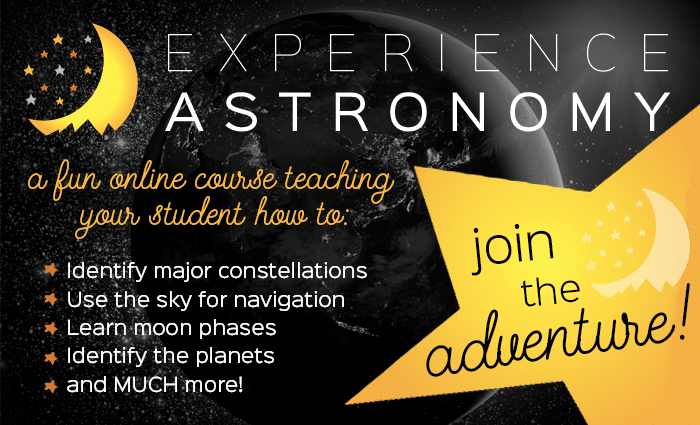 I thought it would be perfect for us because it’s a beginner’s program for grades K-3 and I could get all my school-aged kids involved. For the review I received the student book with CD, which comes bound in the text with 42 songs/chants, and the teacher’s edition. 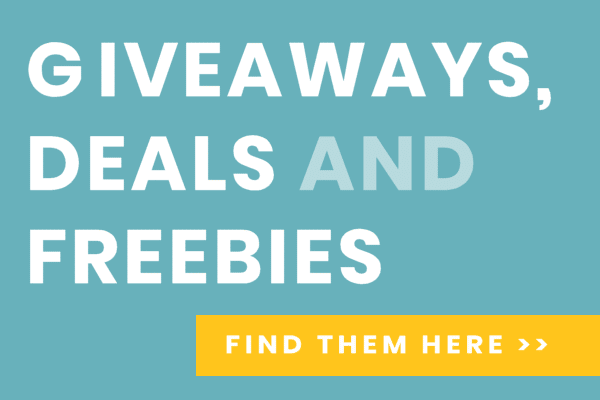 Each book retails for $24.95. 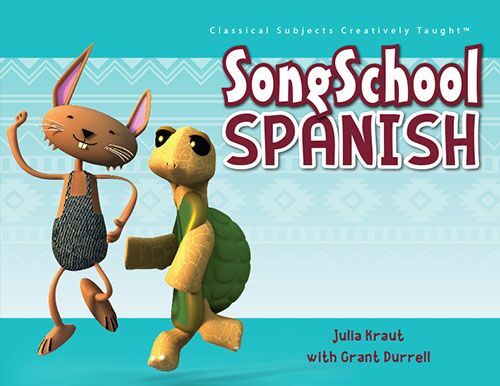 Song School Spanish is a fun and gentle introduction to the Spanish language for your K-3 child(ren). It contains 31 weekly chapters (which includes a review chapter every 3-5 chapters) that are taught using songs and chants, games, stories, and other activities. A generic three day per week schedule is presented at the beginning of both the student book and the teacher edition with the recommendation of listening to the CD more frequently, perhaps on a daily basis. The songs and chants are a key component to the teaching course, with at least one new song or chant presented with each lesson. 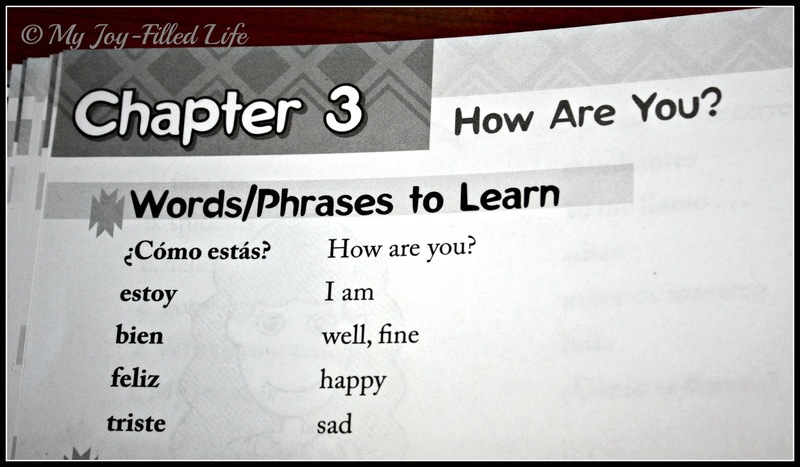 Each chapter begins with the child learning the new words or phrases. If you are learning Spanish along with your child, don’t worry, there is a pronunciation guide at the front of the student book and there are Spanish pronunciation files available to download from the Classical Academic Press website that contains all the vocabulary for the course. Then you learn the songs and/or chants from the CD that correlates with the new words. These are very cute and catchy tunes. I think learning with music is an excellent way for long term retention for kids. My kids loved the music. Be careful mom (or dad), you will find yourself singing these songs in the shower or humming them in the checkout line at the grocery store – don’t say I didn’t warn you. I found it inconvenient to listen to the actual CD everyday. As my husband puts it, CDs are “old school.” So, I put the music onto my computer and then synced it with my phone. Now we can listen anywhere with my phone. Next is the Chapter Lesson. 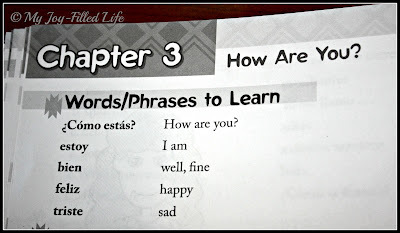 The Chapter Lessons cover things like the Spanish alphabet, accents, some grammar, and suggestions for using the words or phrases in real life. 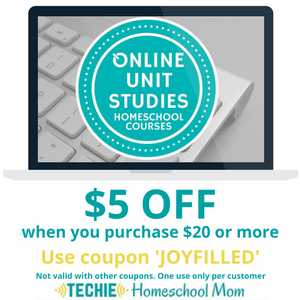 For this, I would simply read, discuss, and answer any questions my kids had about the information. Then you move along to the Practice Your Spanish section. 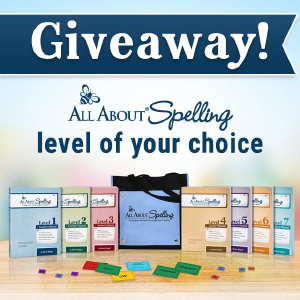 This section has some handwriting practice and a few other workbook activities like matching, fill-in-the-blank, or coloring. I didn’t think it was necessary to have my kids do the handwriting practice and for the other workbook activities, we did them aloud together. Next, most chapters have one or two activities that you can do to reinforce the words. The activities include things like putting on a puppet show, putting on a play, reading a story, or playing a game. The activities are a nice break, good reinforcement, and fun for the kids. Lastly is the Show What You Know section. This is just a short workbook activity to review what you have learned in the chapter. 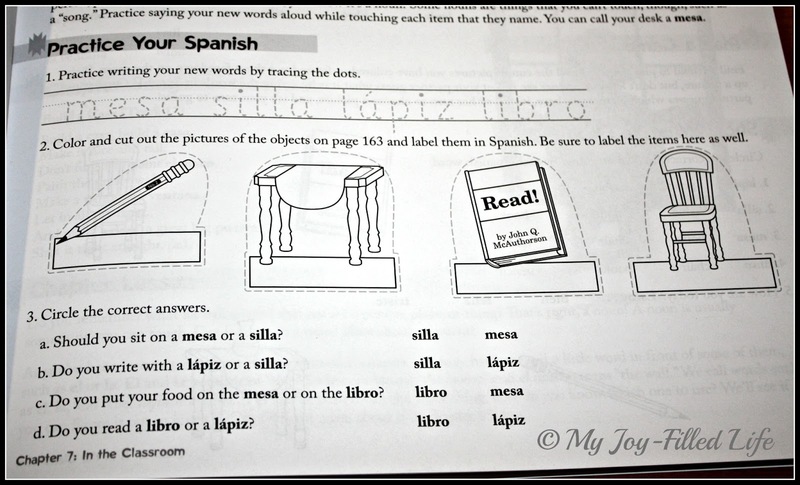 Like the other workbook activities, I did these sections aloud with all my kids. 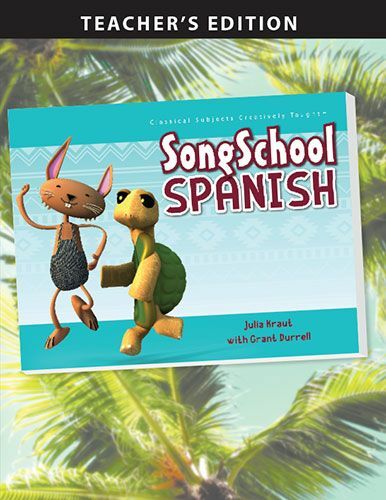 To see samples from the student book, the teacher’s edition, and to hear a sampling of the songs, visit the Song School Spanish web page. The book suggests stretching each chapter out over a 3-4 day period, as shorter and more frequent sessions are more beneficial than longer, fewer sessions. We stuck to the 3 day per week schedule that is at the front of the book. 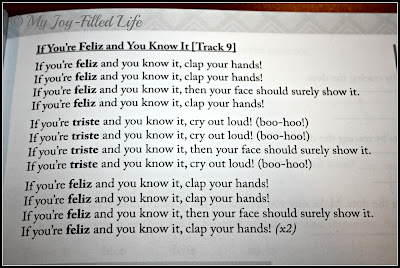 We frequently listened to the songs (not always daily) and practiced our words and phrases often. At dinner, the kids would tell Daddy all the new words they learned and he would often have to correct our pronunciation! What can I say, we have American accents! We would then spend time quizzing each other on our Spanish vocabulary. Out of my four kids (PreK, K, 3rd, & 5th) that used the curriculum, my Kindergartner and third grader definitely enjoyed it and benefited from it the most. Which I guess is what should be expected considering the recommended ages for the curriculum. I was very impressed by what they learned and retained in such a short period of time. Spanish Amigo Match ($26.95) – These are cards that contain all the vocabulary from the course that you can use as flashcards or can be used to play Memory. Activity Pages – At the back of the teacher’s edition, there is an additional activity page for each chapter of the course (2 pages for each review chapter and 4 pages for a final review). 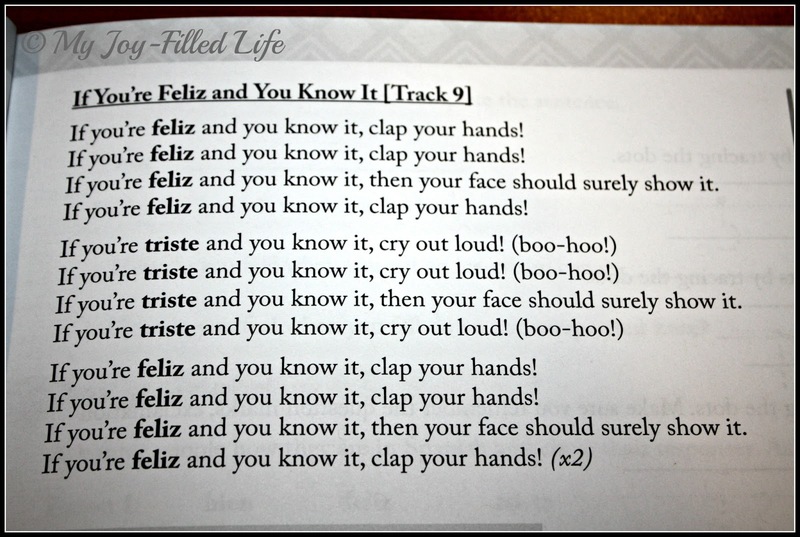 I feel that this is the only reason you would need the teacher’s edition – for the additional practice pages. We didn’t use any of the practice pages and I barely cracked open the teacher’s edition. Most of the information in the teacher’s edition is included in the student text. HeadventureLand.com – This is a free website where students can practice their Spanish by playing on online game called FlashDash that quizzes the student’s Spanish to English or English to Spanish comprehension. 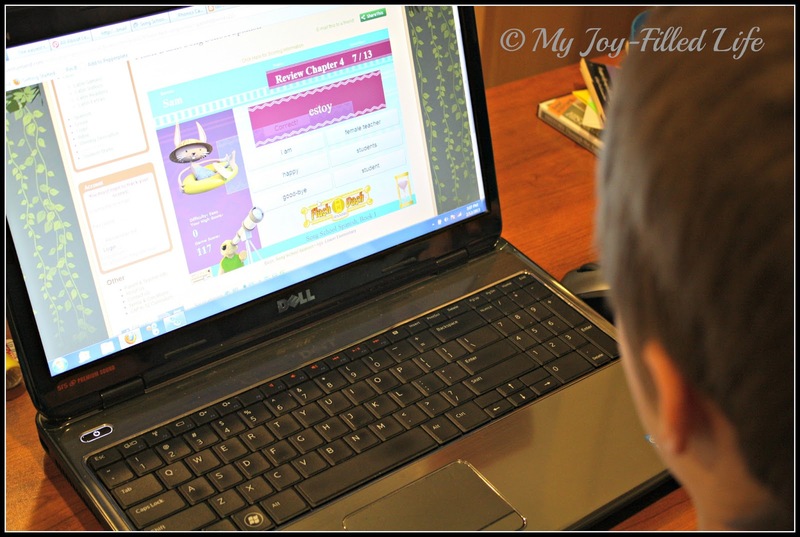 My kids were all over this; they love using the computer for learning. We really enjoyed reviewing this curriculum and I plan to continue using it with my Kindergartner and third grader. 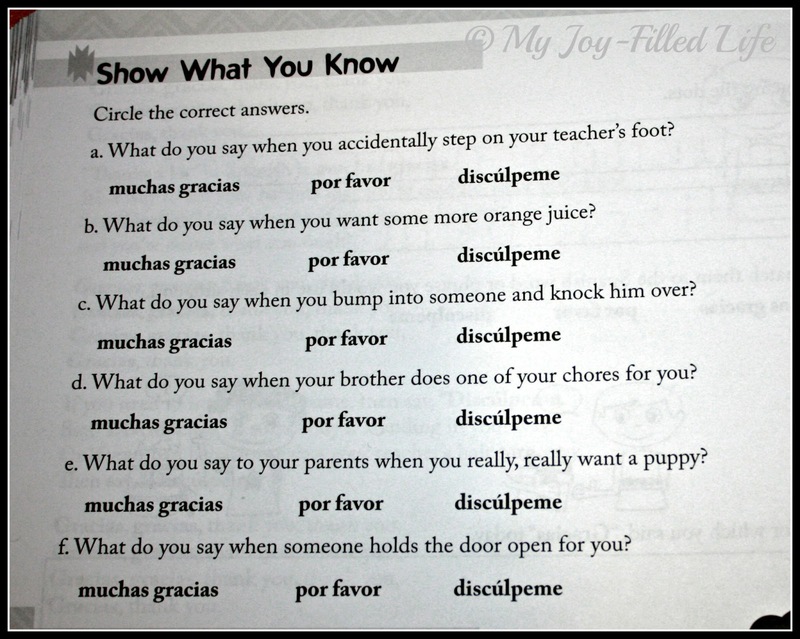 I love that it is a gentle introduction to Spanish using words and phrases that the child can relate to and use. 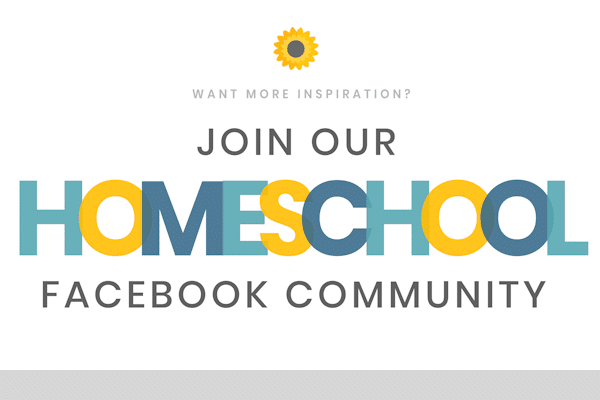 To see what other crew members thought of Song School Spanish, as well as God’s Great Covenant, Old Testament Books 1 & 2 from Classical Academic Press, click the banner below. Love the way you gave a look into the book with your photos, excellent reviewing. I had heard about their Latin songs. Thanks for the sharing this. Love the activities and song suggestions! What a great way to learn Spanish. Thanks for sharing.